Second.... 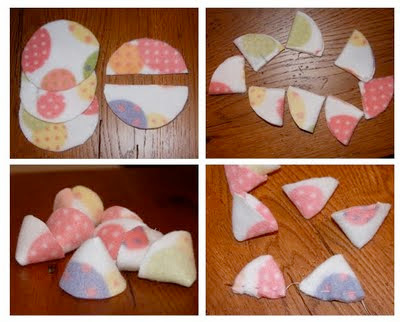 Right side in, fold half circle in half and sew one edge making a cone shape. (Use this same method for a clown costume hat. LOL On a larger scale of course) Totally off subject, but it just popped in my head. Third.... Turn your cones inside out and press down into a triangular shape. Trim excess thread. Fourth.... Rounded end down, take your needle and thread 4-6 times through, pull to end of thread. Continue this until you have all petals on the thread. I use anywhere from 4-6 flowers for a single layer flower. You can also add more petals for a larger, fuller flower by making the bottom layer with 8 or more petal. Then placing a 5 petal flower on top for the second layer. It turns out amazing. TRUST ME! Layered flowers are beautiful. Fifth.... Now you want to gently tug the fabric back on the thread making a petal shape. 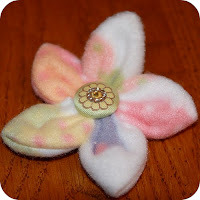 Sew the first and last petals together to finish off the flower. Don't forget to tie a couple knots to make sure it is nice and secure. Add your Button/Brad and your choice of backing (pin, barrette, headband, clip, ect.) and your done. Hope you enjoyed this tutorial. Have fun making your flowers. Glad you like them Rachel. They are quick and easy. You will love them! So cute and such easy to follow instructions. Thanks for sharing. Thanks for these directions. I read through them and I think I could do this based upon what you said, even without a sewing machine. How fun is this? Thank you for the instructions! This is so cute! thank you for posting this. have a great friday follows I already follow you and have for some time and I am so glad that I do. Hi just stopping in to say Hi from Friday Follow! Oh! These are so cute! Sorry it's taken me so long to come check it out. Thank you for linking up to A Little Craft Therapy with Life in the Pitts. Stopping by with HUGS from Friday Follow. SO many wonderful blogs to see and YOURS is one of them. But of course you already know how I feel about it...LOL!!!! This is fabulous. You give great directions. I am already a follower and just had to say again that you have a great blog! Stopping by with Friday Follow. Hope you had a fantastic week. Hi thanks for the awesome party! I linked up, and Happy Follow Friday! Hi! I'm your newest follower from Friday Follow!